Artstuff.net has your measuring tools from standard school protractors and rulers to the more specific architectural and engineering scales. You'll also bump into the often hard to find items such as rolling rulers and Alvin's map, plan or curve measure. 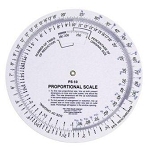 Our scale section is plentiful with choices of flat and triangular scales, plastic or aluminum.